The UM25 is a multipattern condenser, modeled after the Telefunken Ela M 251E. 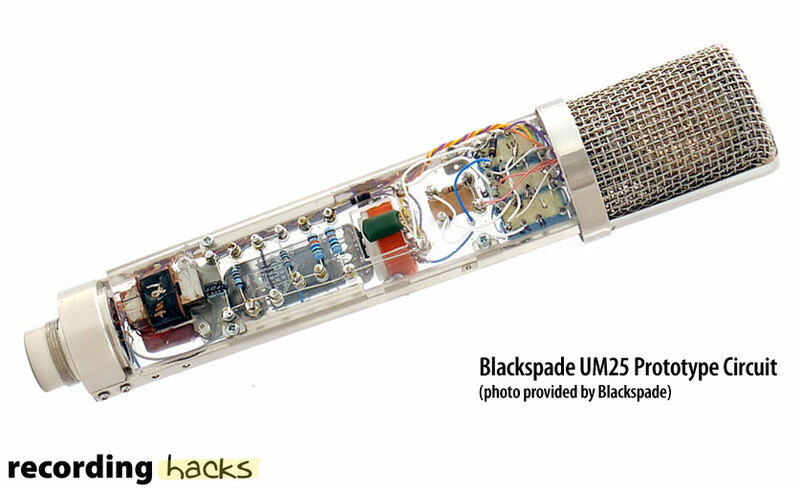 Like the original, the UM25 is a large-diaphragm, tube-and-transformer-based microphone. 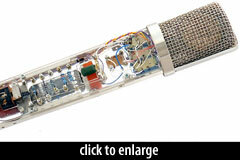 Like most modern recreations of historical mics, it is built with a combination of vintage and modern components. The hand-assembled, point-to-point wired amplifier circuit is an “exact replica” of the circuit in the 251. The T14 transformer from AMI is modeled after the Haufe transformer in the C12 and ElaM 251. The NOS Telefunken tube, whose model has not yet been revealed, is a dual-triode that is compatible with the GE 6072a used in the 250E/251E. The capsule in AKG’s C12 and Telefunken’s ElaM 250/251 was AKG’s CK12, an edge-terminated, large-diaphragm design with an internal resonating chamber. Manufacturing such a capsule today is prohibitively expensive — AKG’s contemporary version of the CK12 has been significantly simplified — and so the capsule in the UM25 has been designed to recreate the sonics of the original without replicating all its manufacturing complexities. [W]ith the help of a well-reputed capsule manufacturer in Asia, [we] created the CK25 especially for the UM25, based on the original historic Telefunken blueprints. With a new resonance concept that is now easier to manufacture with more consistent results, the capsule still produces the very distinct sound of the resonator plates found in the historic CK12 capsules. The porting has been enlarged and the thickness of the backplate slightly enhanced to offset the slightly different resonator design. The result is a split dual backplate design that is edge fed with a resonator that can be made for a more reasonable cost than the original CK12 design without straying too far from the classic 251 tone. The UM25 is a multipattern microphone; a 3-way switch on the power supply allows selection of Omnidirectional, Cardioid, or Figure-of-8. The location of the switch on the PSU is a departure from the Ela M design, which located the switch on the microphone body. The UM25 shares a 44mm-diameter body tube with the UM17, but its headbasket differs visually and acoustically: it is modeled after the headbasket of the Ela M 250/251.